These donuts hit the spot for a breakfast, dessert or just a sweet snack. They are super simple to make too. 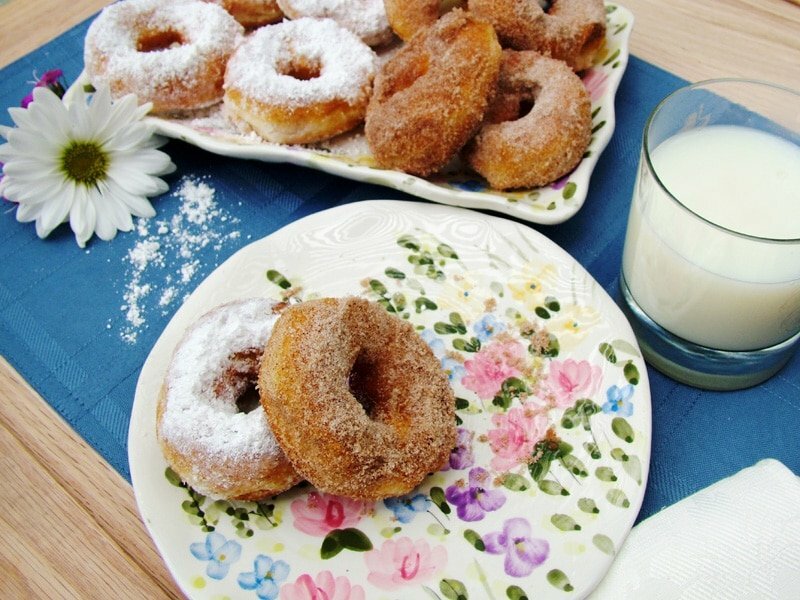 This recipe includes two toppings for the donuts; powdered sugar and a cinnamon-sugar mixture. My fave is the cinnamon-sugar mixture but the powdered sugar topping is good too. They definitely taste best right after making them while they are hot. These yummies tend to get gobbled up quickly so you may want to get an extra can of biscuits or two. Remove the biscuits from the container and let them sit on a plate for about 5 to 8 minutes or until they are at room temperature. This will make them more pliable for making the hole in the middle of the biscuit. In each biscuit, make a hole in the middle by pushing your finger through. Shape the biscuit into a circular ring. In a small bowl, mix the granulated sugar and cinnamon. The bowl should be a bit bigger than the size of one of the donut rings. Set aside. In a separate small bowl, add the powdered sugar and set aside. 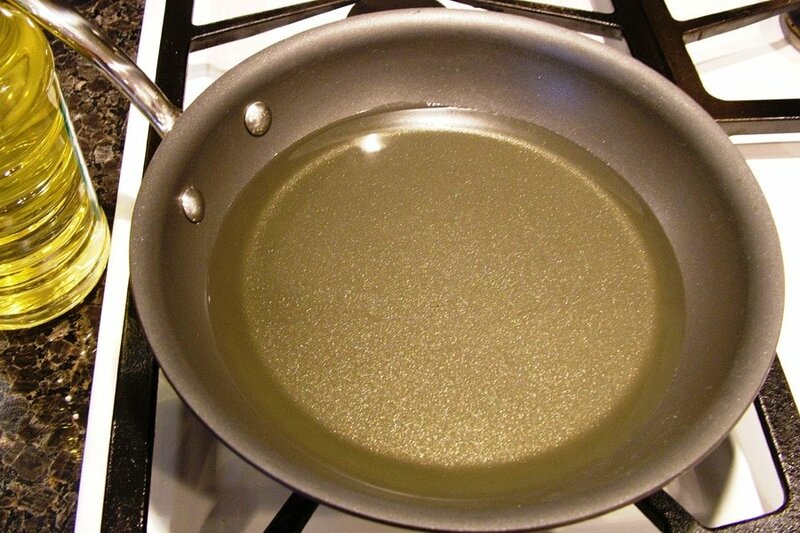 Put the canola oil in a frying pan. The oil should be a little more than about ½ inch deep in the frying pan. Heat the oil on medium heat so the oil doesn’t get too hot. Drop in 4 of the donut rings. It’s a good idea not to add all 10 of the donut rings in the oil at the same time because they cook so fast and you’ll need time to coat them one at a time with the sugar. When the donut side that is face down in the oil turns a golden color, turn it over with a pair of tongs. 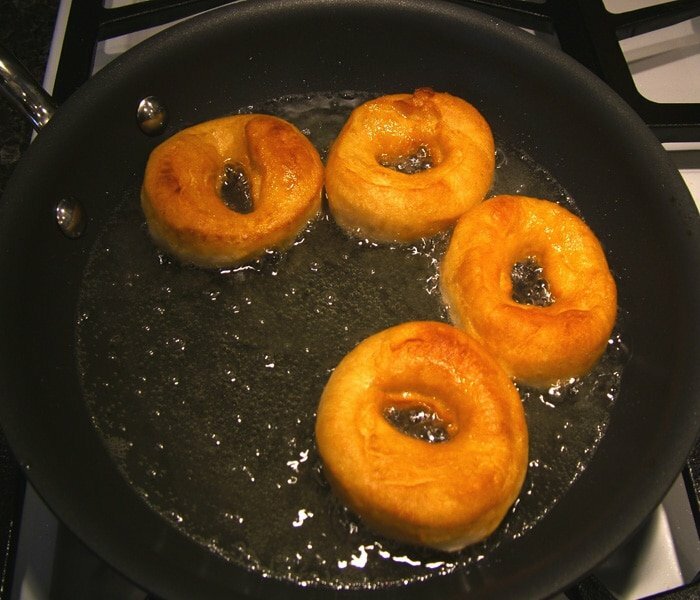 When both sides of the donut are a golden color, remove it quickly from the frying pan. 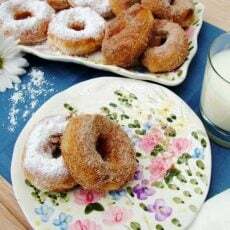 Right out of the frying pan, put one donut at a time in the granulated sugar-cinnamon mixture. Cover the entire donut (both sides) with as much of the sugar mixture as possible. Repeat the process of cooking the donuts and dipping them in the sugar. Serve immediately after cooking. Tastes great with a glass of milk or a cup of coffee. 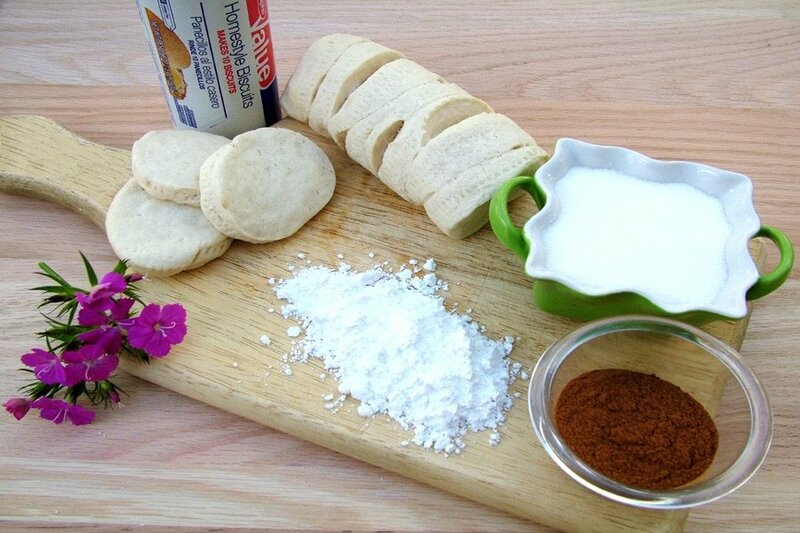 For the Dough - Remove the biscuits from the container and let them sit on a plate until they're at room temperature (about 5 to 8 minutes). This will make them more pliable for making the hole in the middle of the biscuit. Make a hole in the middle of each doughnut by pushing your finger through. Shape the biscuit into a circular ring. 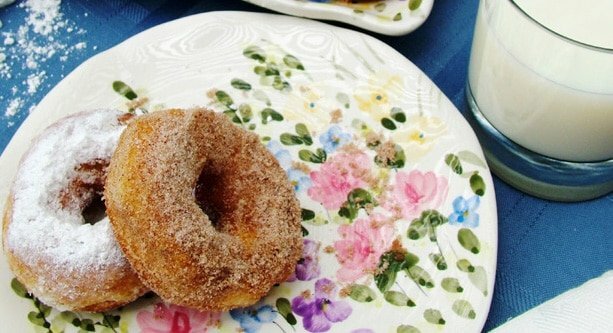 For Coating the Doughnuts - In a small bowl, add sugar and cinnamon. Mix together. The bowl should be a bit bigger than the size of one of the doughnut rings. Set aside. In separate small bowl, add powdered sugar and set aside. Cooking the Doughnuts - In a large skillet add canola oil. The oil should be a little more than about ½ inch deep in the frying pan. Heat the pan on medium heat. 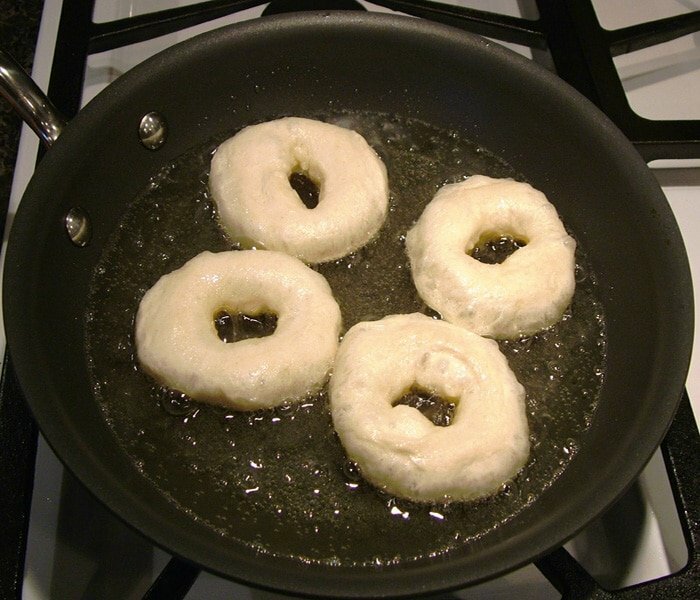 To the pan, drop in 4 of the doughnut rings. 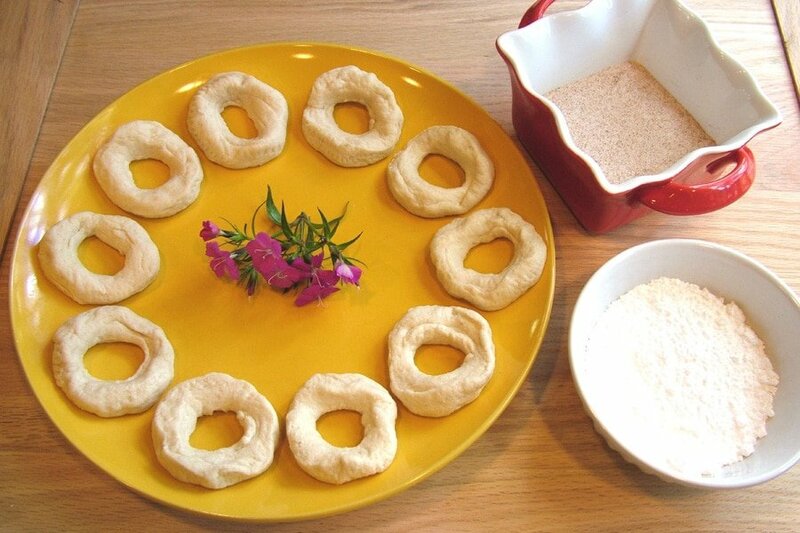 It’s a good idea not to add all 10 doughnut rings in the oil at the same time because they need to be topped with the coatings right after cooking so the coatings will stick. With so any doughnuts the coating can't be added fast enough. When the bottom of the doughnuts turn a golden color, turn them over using a pair of tongs. When both sides of the doughnuts are a golden color, remove them quickly from the pan and put them into the cinnamon sugar mixture. 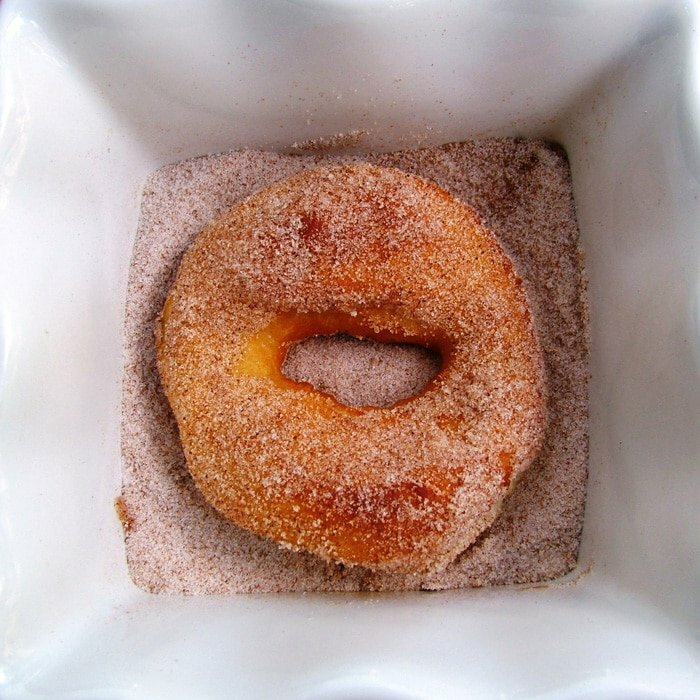 Cover the entire doughnut (both sides) with as much of the cinnamon sugar mixture as possible. For variety, some of the doughnuts can be coated with just powdered sugar. For the remaining doughnut rings, repeat the cooking process and heavily coat each doughnut in the cinnamon sugar mixture or powdered sugar.